What is your favorite thing about LOOP? 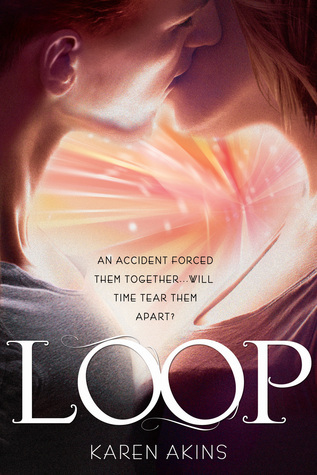 LOOP is about a twenty-third century time traveler named Bree who meets a boy from the past who is already in love with her future self and is keeping his own set of secrets. One of the things I love most about the story is that Finn (the boy) refuses to give up on Bree even when she's almost at the point of giving up on herself. He loves her even when she's unloveable, and that makes it a very hopeful story. I fell asleep while watching my husband play a video game that had all sorts of grappling hooks and explosions. It triggered a vivid, fun, action-filled dream, and right before I woke up, I dreamt the twist that this guy fell in love with a time-traveler's future self. I grabbed a notebook and started scribbling ideas. It was the first time that I'd ever thought, "This could be the one." I started writing it in 2010, and approved my first pass pages just a few months ago so...a long time. I wasn't working strictly on LOOP that entire time, though. I was also writing and revising TWIST, its sequel. Before I had my second child, I would write while my older son was in preschool, usually at a coffee shop or the library. Now that I have two (one of whom is a toddler), I squeeze in writing during naps and after they go to bed. I'm also blessed to have a very supportive husband, so I'm able to get away from the house when I'm on a pressing deadline. "What you want is practice, practice, practice. It doesn’t matter what we write (at least this is my view) at our age, so long as we write continually as well as we can. I feel that every time I write a page either of prose or of verse, with real effort, even if it’s thrown into the fire the next minute, I am so much further on."